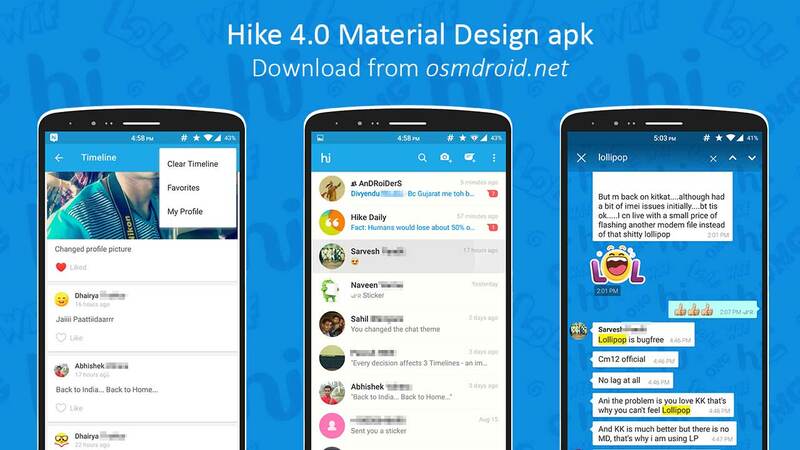 [APK] Hike Material Design update 4.0 officially rolls out with BIG changelog ! Let’s 1st start with official changelog posted on play store. ★ 7 Brand New Stunning Chat Themes! ★ Search Inside Chat Conversation: You can now easily search for messages inside a specific chat. ★ Photo Status Updates: You can now post photos on your timeline! According to play store changelog 4.0 is the “biggest” update on hike history. So let’s share some thoughts on it. • How is Materialization ? We’ve been waiting and were so much excited for material design update of hike messenger but unfortunately they took too much time and we’ve to say it is not worth it. hike disappointed MD lovers. Personally we agree that old icon is still better than newer one cause new one is just TOO MUCH flattened. If they are giving material design update then they should follow Material Design Guidelines from google and add atleast add some shadow to icon. New logo also seems a bit taller or stretchered vertically with more lighter sky blue color which also hurts to eye but somehow this is personal opinion and doesn’t matter much and believe it or not they worked on new logo for three months. !! • Talking about new timeline & search. Timeline with new “Like” feature which also let’s you share photos , update status and notifies when your favorite contacts changes profile pictures somehow looks combination of Facebook timeline and BBM updates.New timeline adds “Like” button and option to “Clear Timeline” in menu. Clicking on bell icon shows who liked your photos or statuses. And sadly timeline doesn’t come anywhere near to card view with shadow of material design which could have been implemented easily. Search in conversation is nothing new cause it is very similar to WhatsApp’s search mechanism. "The new 4.0 rendition isn’t only better looking it’s also lightning fast, 5x to be exact on performance and speed and has been optimized for extreme poor network conditions to target the next billion Indias that come online"
Share the post "[APK] Hike Material Design update 4.0 officially rolls out with BIG changelog !"